A Two Speed, Vibrating Massage Pillow With Decorative Cover. Sit back, relax, and let your stress and tension melt away. This relaxing massager is uniquely styled as a decorative throw pillow, but place it behind you, and the magic begins. As you lean back, a pressure activated switch will turn on this pillow automatically. When you get up, it turns itself back off, so you never need to worry about wasting batteries, or leaving it running when not in use. It is not your average vibrating pillow, and features a pulsating motor for a more beneficial treatment. Regular style pillows will simply shake at the same speed, so your muscles are able to get used to it quickly. This one also vibrates as the massage method, but the speed and intensity will change as it runs to provide a better effect. It will automatically adjust speed, duration and intensity to enhance the massaging action and allow you to relax more easily. This pillow also features a two speed motor so you can adjust the power according to your preference. Just open up the back, and use the switch to choose either high or low as the massage speed. It runs on two D batteries, or you can use adapters sold separately, to power it without them. With the choice of nine great colors, you are sure to find one that matches your décor. Want to power it without using batteries? The battery compartment holds two batteries for convenient use in any location, but to save money, reduce waste, and add convenience, we also carry two adapters that plug into the side of it, and they allow you to power the pillow using electricity. The standard AC/DC adapter connects to any regular wall outlet, and the USB adapter can be used with computers, vehicle outlets, or paired with phone adapters for home or travel. Massage your feet, back, legs, neck & shoulders anytime. It is perfect for use when sitting in any type of chair, riding in the car, relaxing in bed and more. It can be used on any part of your body, and since it runs on batteries, you can take it anywhere when on the go. This is the perfect gift, and would make a great addition to any home. It will relax muscles, and increase blood circulation to decrease pain and pressure, leaving your body feeling rejuvenated and pain free. Since it operates by a pressure activated switch, you never have to worry about turning it on or off because it only runs when weight or pressure is applied. This adds convenience and helps to preserve battery life. It also makes it incredibly easy to use and perfect for anyone. It starts vibrating as soon as you lean on it, and turning it off is as easy as walking away or switching positions. The high quality cover comes in nine great colors, and is totally removable and washable. Thanks to the durable material, you can be sure that this pillow will look great for years to come. Thanks to low power usage, the batteries will last for several hours of constant vibrating, but you can also plug it in and never have to worry about batteries at all. A high quality vibrating massager and decorative throw in one. Just lean back on it to relax your troubles away. The pulsating vibrations will penetrate deep into your muscles to promote relaxation and relieve tension. You will be left feeling rejuvenated and stress-free. With no buttons or switches to worry about, this pillow is beyond simple to operate. If you lean against it it will turn on, and once you walk away, it automatically turn itself off. This high quality neck and back massager is the perfect addition to any home. It is uniquely disguised as an attractive throw pillow, but offers a soothing massage any time you need it. High quality materials and construction ensure that this pillow will last for years of pleasureful use. It is perfect for travel, driving, home use and more. Order Yours Today! Dimensions (l x w) 13" x 13"
Deluxe, Pulsating Massage Pillow - Relax your body, relive stress, and let your troubles melt away as you lean back on one of these great massage pillows. 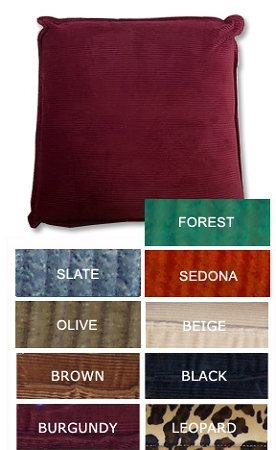 With many colors to choose from and a stylish corduroy finish, you are sure to find one perfect for your home. Order Yours Today! Pillow works as stated.Inside the pillow is the switch to change massage level from high to low.Also inside the pillow is wear you will hook up the ac adapter if you purchase one separately. The controls are hidden meaning the wires don’t fray. My husband uses it every day both in house and in car. I love it ! Have a chronic lower back pain, and this takes care of it. Love this pulsating message pillow! Powered by two D batteries or the adapter cord sold separately. Pillow activates when you apply pressure. Automatically shuts off when no pressure. Plan to use on airline flights. Great idea for pillows. My family loved them. I have dealt with a lot of pain in my lower back,legs and feet for years. Since I got my viberating pillow I carry it with me almost everywhere, it's become my little "buddy"! I love the fact that it's pressure activated. You can feel it drawing the pain out! I ordered this item before travelling with my father, who is 92. He has difficulty with his back in the car. I was disappointed not to get the pillow before this trip. He does like it at home and will use it on our next trip. The pillow is as soothing used in my home as it was when I tried it at the Chicago Flower Show. At home, it was and is very noisy on the highest setting and I have a hard time watching TV with it on. The order I received is great. Getting the order however was an incredible pain since the company forgot to add my unit number so I missed the shipment 3 days in a row since FedEx didn't know what unit to send it to. But I will not blame the company since its very possible that I am the one who may have forgotten the unit number. I doubt it, but its possible. Pillow is great! Pulsating Massage Pillow: Great Idea! Each of these 6 pillows helped make the long drive to North Carolina more enjoyable for 6 of us. We drove all night, so they took some of the kinks out of ourselves, enabling us to arrive in better spirits. It's kind of hard to keep "pulsating", you have to push pretty hard on it. When it does pulsate, it feels wonderful. Love the concept of this pillow, but is hard to activate. You need to lean hard on it for it to start working. The whole idea I had for using this is to relax and not have to concentrate on how hard I'm pressing on the pillow. Excellent item. Provides 2 vibration speeds, batteries last long time. I would recommend to others. Quality is excellent, color is great and they work perfectly. If you've got an achy shoulder or back, these work wonders! Great, wonderful, magnificent and all sorts of other good things. I use my three at home, at a friend's house in LA and at the ranch up in the foothills of the Sierra, everywhere I sit for any length of time. It's wonderful for a sore or tired lower back, with just enough vibration to ease the tension that gathers there. Thank you! I had this in past years and still use it. It's an awesome and amazing to where I will use when I am having back and feet aching. My father in law tried and fell in love, begged me to get him one. So I ordered this for him. Now he can enjoy his own pillow instead of stealing mine! Definitely will recommend anyone to get this! Its all worth. Love the pillow but had to settle for third choice in color. We now have 4 of them around the house in favorite sitting chairs. We are spoiled! Had one of these for 5 years before it finally quit working.We used it alot. New one looks the same, but doesn't work as well.Much noisier than first one,and does'nt vibrate as well. Still, it is helpfull for relieving sore back and hips. Got two of these massage pillows and, for the most part, am very happy with them - only complaint is thery are too noisy while vibrating. can these pillows be purchased by check? Yes. You can checkout online and select check/money order as your payment method. We will ship your order once the payment arrives. Is it possible to get replacement motors? Does it switch from vibration to pulsating while on? Was this sold at kiosks around Christmas? Is the plastic cover removable? Yes. It's just for packaging. I am interested in buying this for my 11 year old grandson who has autism and sometimes needs a vibrating feel on his body but some reviews say that the motor is very loud and noise is an issue with him. How noisy are these pillows when vibrating? Thank you. It's not very loud at all. There is a noticeable hum because a motor is vibrating, but the noise is not overwhelming or annoying to most users. It will depend on the batteries you use, but in general, they last a long time. Thanks to the pressure activated switch, it will only be drawing power when you are using it. Will this pillow help or irritate sciatica pain? Most users find it helpful for this type of pain. Is there anyway to make the pillow stay on without applying pressure? The switch is pressure activated for convenience, and to avoid wasting batteries. There is no always on setting available, but you may be able to achieve this with some modification. AC Adapter - An AC adapter to power it without batteries. Massage Pillow Combo Get the AC adapter and pillow together for an even lower price. A Handy Tool For Hanging Pictures. Fast, Easy and Accurate! Complete Set With AC Adapter. Features 3 Identical LED Lights And A 20mm Disc.